New to Robinson Music Library starting next week will be a series of events titled the Robinson Music Library (RML) Discovery Series. We will be screening/playing works of music that fall outside of what we consider the standard musical repertoire. After each screening, we will be holding discussions that I (Patrick) will be leading, which will give a chance for students, faculty, and staff in attendance to really talk about music. But when there is already an overwhelming amount of excellent music that we already have to learn in the “standard” repertoire, why should we spare valuable time looking at these other works? One of the beautiful aspects of our formal music education is the thorough exposure we get to the standard repertoire for our respective instruments, voice types, etc. We learn the myriad sonatas, songs, and cycles for which we are the new ambassadors in our musical generation. But with so many works demanding our attention, it is easy to forget that there is a great deal of music out there that is not widely performed or widely known at all (save for a few scholars or performers breathing life into these pieces every few years). The same can often be said of the music being composed today. Our modern composers are forced to fight constantly against the titanic memories of great composers past at every turn just to get a nod. And unfortunately, performances of their new works often do not receive the time, nor the preparation, given to pieces that are imbued with the weight of history and repetitious recognition. This isn’t particularly fair to them, or us, in the long run. It is important, in the process of developing our musical identities, to take in as much music as possible. Similar to the way we eat a variety of foods to ensure we get a proper balance of nutrients in our diet, it is likewise important to vary our musical diets as well. Try new things, sample new composers, listen to repertoire for other instruments… Even explore styles you may think you dislike or have no interest in at all. Be radical in your exploration. You never know, you could very easily find your new favorite composer or piece when you step outside of your listening/viewing comfort zone. Just as it is important to hear all of these varied works, styles, instrumentations, etc. it is also important to actively digest the new music you are consuming. It’s easy to sit and listen (if you carve out the time to do so), but the next step is to engage with what you’re hearing/seeing. What better way to do that than sit with other musicians and talk critically about music? We don’t often get a chance to sit with our peers and really talk about music outside of class. I’m sure we all chat as groups after orchestra concerts or other performances, but usually this kind of cursory discussion is commentary on who made what mistake or how shockingly fast/slow the conductor took the final movement. We don’t necessarily take the time to dig in though, learn the music and its context, and really ponder things. That’s where I come in! We’ll be piloting these sessions a few times throughout the semester (all on Tuesday evenings from 6-9 p.m.). 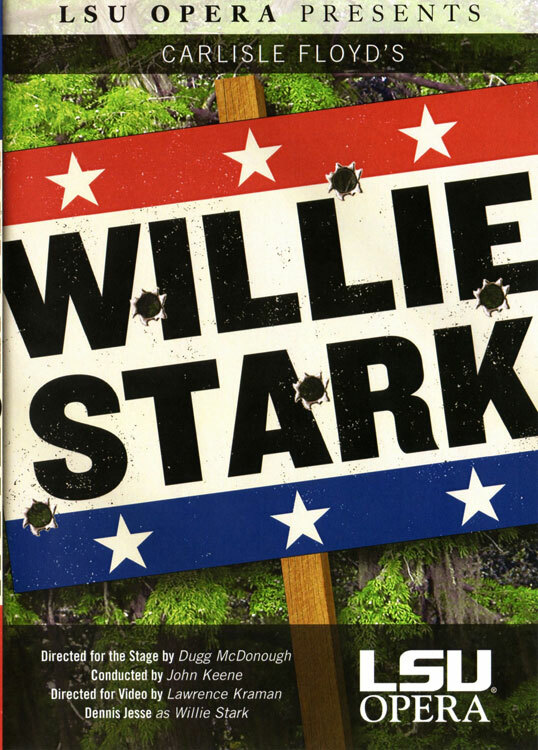 The first one up is Tuesday, September 22nd at 6 p.m. To kick things off, we’re going to take a look at Carlisle Floyd’s Willie Stark, an opera that premiered in 1981 and received a revival in 2008 thanks to the opera department at LSU. If you’re not familiar with Mr. Floyd’s work, give a listen to soprano Renée Fleming singing an aria from arguably his most popular opera, Susannah: https://youtu.be/hl_Hs4PNT-c. We’ll be down in the Media Center group rooms; drop in to see us! So, let’s sit and listen to awesome/unusual/controversial music. Let’s discuss it and see what we can come up with—there are no right or wrong answers, just our thoughts! Let’s find out what new things we like, what we can’t stand to listen to again, what we disagree about… Let’s discover some new music together! Check out our Facebook event page for more details and materials to check out in advance: https://www.facebook.com/events/1637418219831332/. If you haven’t liked our page yet, do so to get all the details about RML! While RML will always strive to bring you the best resources to support your studies, there is a whole wide world of resources out there that we simply can’t have on our shelves (due to space, cost, etc.). Even Case Western libraries, while expansive in their coverage, do not have every material for every person’s interest area. This is where OhioLINK comes in. OhioLINK unites the many libraries across the state, both academic and public, and makes each individual collection available to borrowers from any other participating library. Not only that, but they allow you to request materials online and have them delivered to any library of your choosing in the network. Consortia are wonderful things, but it’s particularly amazing when you realize that instead of having access to thousands of books, you now have access to millions of them! Okay, so that’s great, but let’s talk about why that is really great for you as musicians. Consider that now, instead of just having all the amazing scores and recordings available to you at RML and Kulas, you now have access to specialized music collections across the state like those at Oberlin, CCM, OU, and Ohio State, just to name a few. In turn, these users now have access to borrow the amazing materials that we have here. Don’t worry, however, a core collection of our items has been designated just for use for students and faculty of the Joint Music Program here at CIM/Case (marked with the green JMP stickers you’ll see around the stacks). We’ve gone from hundreds of users to millions of users, but our mission is always going to focus on serving you, our CIM students, faculty, and staff! If you haven’t tried the service yet, give it a shot! You’ll need to stop by the RML Circulation desk to get your library account number so you can place requests, but feel free to pick up one of our new bookmarks that give you a step-by-step list to requesting items. Or you can always drop by our Reference Desk for a quick tutorial! Until next time, enjoy this new, awesome resource! First and foremost, welcome back to CIM for this new academic year! While students were away this summer, Robinson Music Library has undergone several changes that you may notice when you stop in to visit us. Before we go any further, I would like to introduce one of these changes: Me! 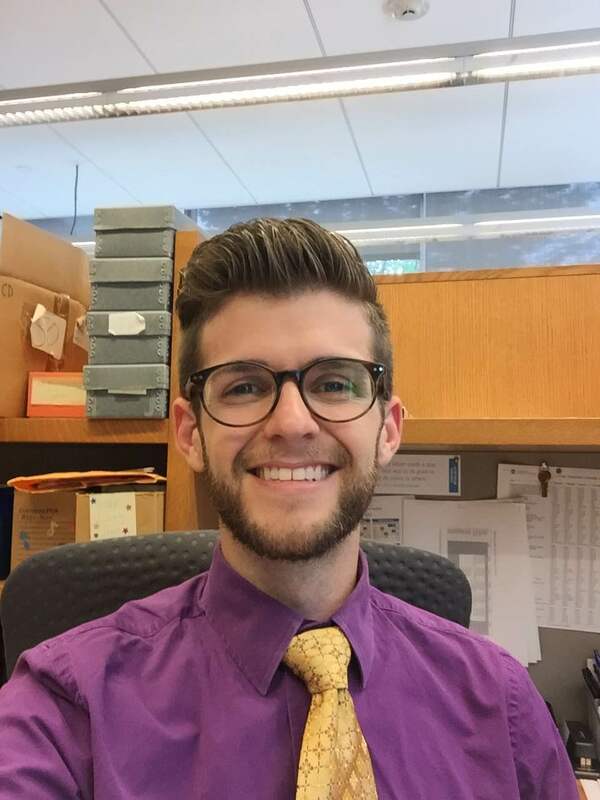 My name is Patrick Fulton and I am one of the Research Services Librarians here to serve you in the library. I came to CIM in July having worked the past few years as the Circulation/Reserves Manager for Florida State University’s Allen Music Library. I’m very happy to be joining the Robinson Music Library team and will be authoring the content for the Blog as well as our other social media platforms from here on out. (Shameless plugs to follow, be advised.) The summer brought a bit of restructuring to the library as well. While we used to have one librarian specializing in Reference services and one focused on Media Center services, Denise Green and I will now be covering both areas under the umbrella of Research Services! We are here to serve you with whatever your information needs are—we have an “Ask Us Anything” policy, so don’t hesitate to bring us your questions, library-related or otherwise. We’ll be working both desks along with our student teams and look forward to meeting you. Additionally, we welcome Jon Borgetti to our part-time staff in the Media Center this year! There are, of course, always new materials and resources for you, but one thing remains the same: Robinson Music Library is here and ready to help you get the most out of your time at CIM! What do you fear most about research? I tried a new thing this year in my one-shot information lit classes. 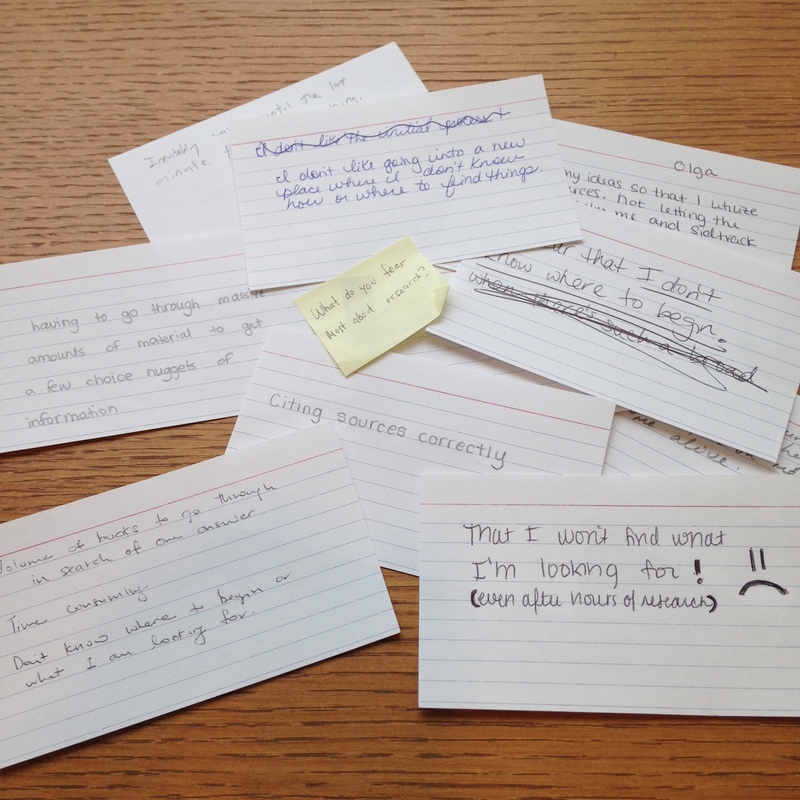 I began each session passing out 3 x 5 cards and asked each student to list what they feared most about research. It’s nice to design the session around what the students actually need rather than what I think they should learn. I read them outloud during class. The students are pleased to learn they are not alone in their fears as the answers are all quite similar. Library Fines. Love ’em or hate ’em. Just read a very interesting article from a university in British Columbia about dismantling their fine system. Often considered a necessary deterrent to make sure library items actually return to the library, this study proved the opposite to be true. Actual checkouts of physical items had been declining for a decade which accompanied a similar decrease in fine revenue. The thought was if the fine system went away, maybe circulation numbers would increase. Replacement charges remained for lost items, but those pesky overdue fines disappeared. The result of their experiment showed no change in circulation numbers of the collection which was disappointing; however, the collection “was not pillaged” and remained in good order. While fine income was eliminated, exceedingly glowing reports of the library’s good will spread among students, faculty and staff. Interesting stuff. In all honesty, I currently have $5.50 in overdue fines to my local public library. It is a little niggling thing in the back of my head that I need to take care of, but it is annoying. 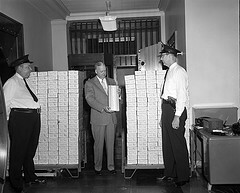 Yes, the fine system is part of being a member of a larger community, but honestly, the books came back when they did regardless of the fine system. CIM has a very generous loan policy that extends the entire semester with fines kicking in at that point. Replacement fees are levied for items that do not make their way back. Still, this nags the question, do overdue fines scare away potential users? Or are they a necessary measure to ensure the continued existence of the collection?